Google for Education's free tools for educators and learners now also available throughGlow (central single sign on portal created by our partners RM). Learn how to share, collaborate and get creative with these online tools that are easy to use, accessible anywhere. Explore how these tools can support the four key capacities of the curriculum for excellence. From Primary to Senior Phase, G Suite has tools you can put into place with your learners tomorrow. As part of the attendance fee, attendees will receive a voucher codes to take the Google for Educator Level 1 Exam for free and access to resources to support them in achieving this certification. Keynote Speakers confirmed for Chiang Mai! We hope you can join us this February 2, 3 and 4 for the Northern Thailand Google for Education Summit hosted by Prem International School. 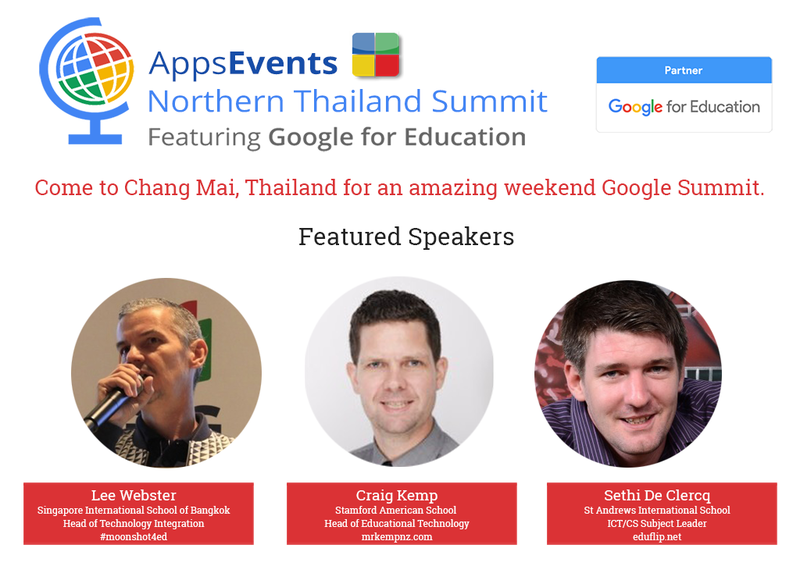 Our special guest presenters Craig Kemp (mrkempnz.co), Sethi De Clerq (eduflip.net), and Lee Webster (Solve X in Tech) will be showcasing the latest G Suite Education uses from around the globe together with a host of other talented trainers.